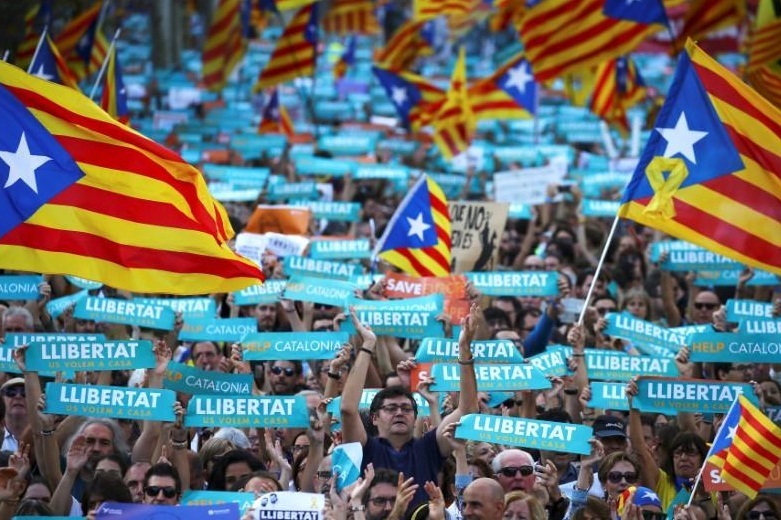 BARCELONA - The Spanish government has urged Catalonians to accept direct control from Madrid and ignore instructions from the restive region’s secessionist leadership once it has been removed from power. The decision, to be implemented this week, brought tens of thousands of pro-independence protesters onto the streets of Barcelona on Saturday and was rejected by Catalan President Carles Puigdemont. Street protests for and against independence in Catalonia have involved hundreds of thousands of people. Though a violent crackdown by national police during Catalonia’s Oct. 1 independence referendum left hundreds injured, the protests have remained peaceful so far. Catalan President Puigdemont, who made a symbolic declaration of independence on Oct. 10 after the referendum, called Rajoy’s move the “worst attacks against the people of Catalonia” since Spain’s military dictatorship. Puigdemont has stopped short of saying he would make good his threat to push ahead with a parliamentary vote on independence before direct rule takes effect. “I ask the (Catalan) parliament to meet in a plenary session, during which we, the representatives of the citizens’ sovereignty, will be able to decide over this attempt to liquidate our government and our democracy, and act in consequence,” Puigdemont said in a televised address. Rajoy, who acted with backing from King Felipe and the main opposition party in Madrid, said the crisis was jeopardizing recovery in the euro zone’s fourth-largest economy. “Our objective is to restore the law and a normal cohabitation among citizens, which has deteriorated a lot; continue with the economic recovery, which is under threat today in Catalonia, and celebrate elections in a situation of normality,” he said. The regional assembly is expected to decide on Monday whether to hold a session to formally proclaim the republic of Catalonia. The Spanish government has urged Catalonians to accept direct control from Madrid and ignore instructions from the restive region’s secessionist leadership once it has been removed from power. Sunday’s message came a day after Madrid resolved to take the unprecedented constitutional step of firing the Catalonia government, a last resort to thwart its independence campaign and calm fears of unrest and economic turmoil in the heart of the euro zone.